Remarkable cafe-restaurant, serving mainly Western food, with a terrific riverside location (the upper terrace has stunning views). Why Cargo Restaurant is special ? Each establishment has been the first in its genre. From family-style and gourmet Vietnamese, to one of the best bakery and patisseries in the country, Ms Vy has succeeded in delighting visitors from around the world with her menus and entertaining personality. While always serious when it comes to the quality of her food, she is an otherwise fun and generous host and a pleasure to meet. International restauranteur and teaching chef Ms Vy has more than 30 years experience in the kitchen - the first 10 spent in her family restaurant as a child and young adult. The latter 22 years were in her own restaurants, starting with Mermaid in 1992. 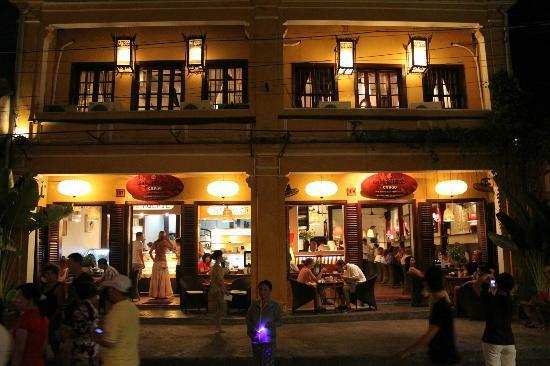 Not only was she the first restaurateur to cater to international guests, she is the original teaching chef of Hoi An, having created the first locally-taught cooking class in 1994. Since then, she has established one of the best classrooms for teaching in all of the country, and remains one of the few Vietnamese-born restauranteurs and chefs to operate an international-standard cooking class. How to get to Cargo Restaurant? We called on spec and they managed to give us a table about an hour later on the terrace as requested. A great mix of western and Vietnamese dishes on the menu(s) but three out of our four dishes were western and we're cooked beautifully. In particular, my fillet steak was excellent; cooked rate as I like it, tender and juicy and a real bargain at just over $10! Dauphinoise potatoes made with mozzarella is a new one on me but it worked and was very tasty. All in all great service and food resulted in us having a great evening so a big thumbs up!!! What a great restaurant this is! Owned by Mrs. Vy (who also owns Mermaid, Morning Glory and Mrs Vy's Kitchen) this is a fantastic restaurant! We stumbled across it for lunch and were gobsmacked by how great the food was! They have two menus - one Vietnamese and one Western. Trust me - go for the Vietnamese option, you won't be disappointed! We also ate at Morning Glory and felt that this restaurant did everything slightly better - more detail and better service. Everything we had from the fresh and fried springrolls to the beef and pork skewers and the curry served in a coconut that they deliver on a plate with fire was exceptional! Go here for either the terrace upstairs that overlooks the river or sit at the front and watch the world go by. Also, leave room for dessert - all are amazing! Only went to this restaurant to eat their cakes which are beautifully displayed in several display cabinets downstairs in the main entry area. Truly an amazing display of beautiful French cakes so artistically prepared and presented. Extremely tempting.I have eaten here a long time ago - but not on my last visit.Instead just went there most days and sat outside enjoying watching the interesting parade of people going by whilst enjoying a mango juice and a beautiful French cake. Would highly recommend you go here if you feel like a coffee or drink and delectable cake. Easy to spend a very relaxing 430 - 45 minutes - plus they have free WiFi. We ate at the Cargo Club for dinner with a large group including six children. The service was great, the food was brilliant and the view wonderful - especially on dusk. A great spot witness great food. Tip: try the yummy but super cheap deserts that are made on premises.